It is now 10 years since the USA declared GENOCIDE in Darfur, Sudan. Humanitarian assistance is essential, and more is needed to protect innocent Darfuri civilians. In Darfur and in refugee camps in Chad, hunger has reached alarming levels. However, delivering food, including cans of oil, cannot be THE strategy in responding to genocide. We CAN do better. 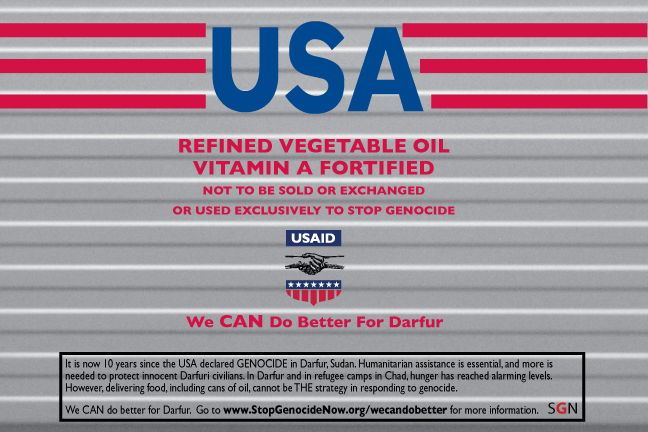 @AmbassadorSamanthaPower, #WeCANdobetter for Darfur. It is now 10 years since the USA declared GENOCIDE in Darfur, Sudan. Humanitarian assistance is essential, and more is needed to protect innocent Darfuri civilians. In Darfur and in refugee camps in Chad, hunger has reached alarming levels. However, delivering food, including cans of oil, cannot be THE strategy in responding to genocide. We CAN do better. Go to http://stopgenocidenow.org/wecandobetter/ for more information. 3. Ask your family and friends to do the same. Share this link: www.stopgenocidenow.org/wecandobetter. A quick click and a glance could lead to action. The wars in both Sudan and South Sudan are escalating, and cross-border conflict connections between the two are deepening. Sudan is experiencing unprecedented levels of violence: deadly fighting in Darfur now rivals the intensity that triggered global outrage in 2003-2005 and a relentless campaign of aerial bombardment and military attacks in Nuba Mountains/South Kordofan and Blue Nile is in its third year. In neighboring South Sudan, despite an agreement to “end the conflict,” clashes persist and state collapse is still possible. Pockets of famine and genocidal targeting are threatening both countries and the intensifying conflicts are pulling in neighboring states. These challenges require a much greater effort from the U.S. in the areas of accountability and consequences, diplomacy and peacemaking, democracy building, and aiding and protecting the most vulnerable. Please do what it takes to end genocide and crimes against humanity in Sudan and end the conflict in South Sudan.